Pear trees perform best in an open-center, or vase, shape with three to four fruit-bearing limbs that emanate from a central trunk. Obtaining this shape takes three years of careful pruning, followed by annual maintenance. 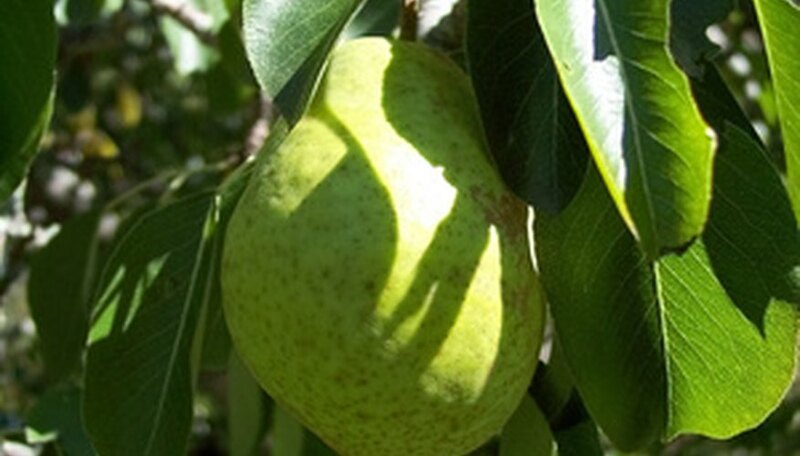 Well-pruned pear trees reward a gardener by producing high-quality fruit and staying healthy. Prune pear trees in the dormant season, late winter to early spring, once frost danger passes for your region. Examine your newly planted pear tree. If the tree has only one to two branches, cut the tree back to a height of 36 inches. If your tree has several branches, leave it alone unless those branches are half as thick as the trunk. In that case, remove the thick branches by cutting them off at the base with lopping shears. Allow the pear tree to grow for the first season. Prune in the dormant season when frost danger passes for your area. Select three branches to serve as scaffold (or fruit-bearing) limbs. Good scaffold limbs grow outward and upward, and are spaced around the tree, not clustered toward one side. Leave the scaffold branches alone and remove competing branches that have developed by cutting them off at the base. Prune off suckers that grow from the base of the pear tree or from the site of past pruning cuts. Suckers won't bear fruit and will sap energy from the tree. After this, allow the tree to grow for the second season and prune again in the dormant season to complete pear tree training. Remove branches that compete with scaffold limbs as you did before. Prune off any vertical offshoots form the scaffold limbs; you want to train these limbs to grow out, not up. Cut off suckers as you did before. Eliminate any branches that crisscross other branches or those that shade the scaffold limbs. At this point your pear tree will be well trained to a vase shape. In future years, continue to maintain the shape, prune away suckers and remove limbs that crowd the canopy. Use anvil pruners for growth thinner than 3/4 inch; use lopping shears for thicker growth.